This is the first time I've had this issue, but it has me a bit scared now to cut any of the other expensive figures lumber I need to work on. This neck is longer than 24" so it was being milled on a diagonal line (hence the finishing path pattern). However, at the very end of the absolute final path/cut something happened. I don't know what as I wasn't around for it... but it looks like the x-axis lost some steps and so things started cutting too right right. As you can see the roughing pass did just fine. I have also re-tried this file in some scrap and it worked fine, just like all the other times I've run it. What would cause something like this? Any help that could put my mind at rest before I strap more expensive guitar wood to the table would be greatly appreciated! Info: 3IPS with a 1/4" ballnose. I believe it's 2IPS plunge. 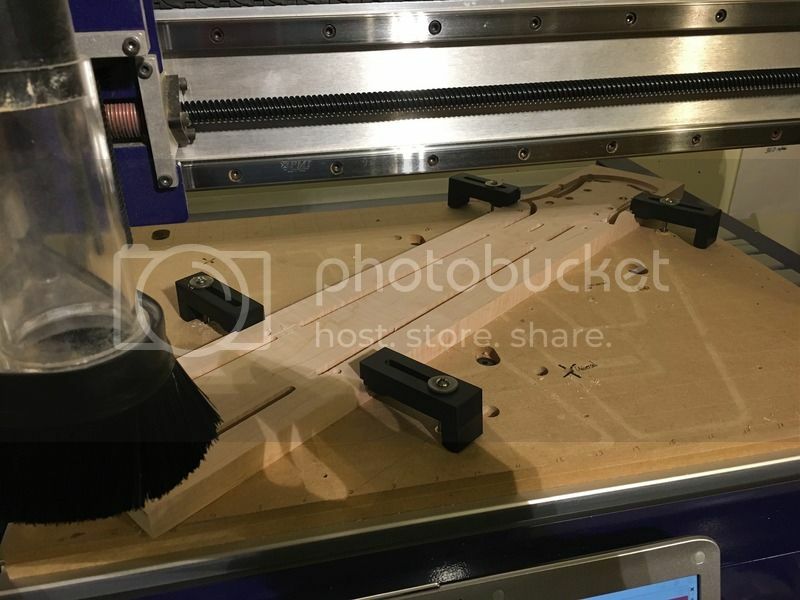 Shopbot Desktop and the path was made in MeshCAM. Was anything prohibiting the machine from going over on the far side of the Y axis at the end of the cut, like a DC hose or whatever? Hose hangs from the ceiling. When I came back and saw what happened I checked the rails but didn't find anything troubling. I also changed/clean absolutely nothing before running the path again in pine (with success). PS: it's been run in other hardwoods before this issue just fine as well. This pic may help people understand what happened. Looking more this could be a jump forward in X, or the Y being held back and skipping...? Where are you? It is starting to get dry in the shop... is you DC hose grounded? You could be loosing steps due to a couple of issues. In the first images, it looks like it happened right at the spot of taking a larger bite into the full height tabs. Depending on your % overlap, along with feedrate, the most stress or force required would be right there. I'd make those tabs much thinner so that they don't interfere with the ballnose path. If you want a better finish, at the cost of more cutting time, drop the overlap % down to about 10%. I'm just north of DC in MD. DC isn't grounded as it's, now now, just my Rigid shopvac hooked up to a plastic hose hung from the ceiling to keep it out of the way. Static could be causing the motor to hiccup?!?! I initially thought that to SRWTLC but that is a tab left by a previous path from before I flipped the piece over. This path goes up to it, but doesn't cut into it. Also, even if it does hit that tab for some reason, it would have done so at each level of the roughing pass as at the end of each pass there the toolpath runs a perimeter cut. Also, there's 4 total tabs like this in this toolpath and it's never accidentally bumped one before, especially to this degree. Could some of that dust skirt have gotten caught under that black hold down clamp and bogged the XY movement on that end causing it to lose XY position? Just throwing out stuff. Could be a static issue also as others have pointed out.